Die Britischen Inseln nach ihrer kirchlichen Eintheilung bis zur Reformation. 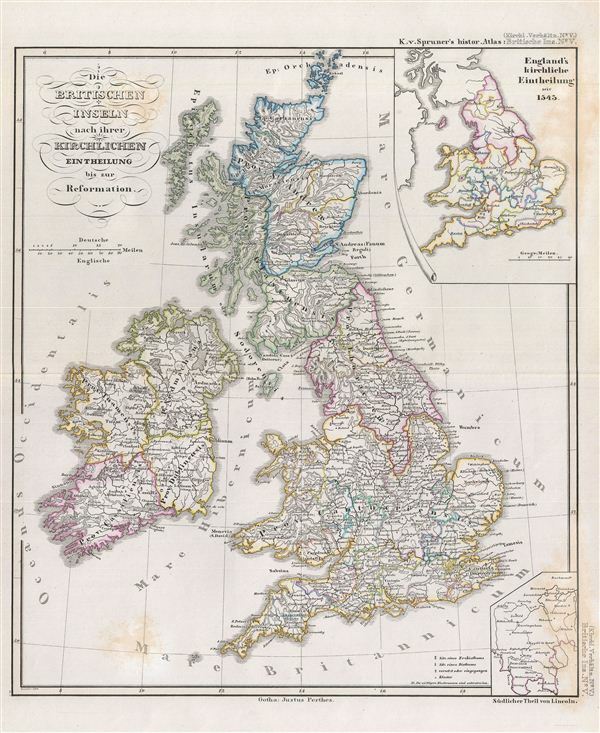 This is Karl von Spruner's 1854 map of the British Isles showing it ecclesiastical divisions at the time of the english Reformation. The map covers from the Orkney Islands to Cornwall, including Ireland. Inset maps on the top right and bottom right corner detail england's ecclesiastical division since 1545 and the southern part of Lincoln. The map england as Henry the VIII created the Church of england and split from the authority of the Roman Catholic Church. Under the Church of england, Henry VIII and all subsequent english monarchs the dominant ecclesiastical as well political force in england. The inset map identifies Canterbury in 1545 as the Prebendaries' Plot led to the archbishop of Canterbury being declared a heretic. The whole is rendered in finely engraved detail exhibiting throughout the fine craftsmanship of the Perthes firm. Prepared by Karl Spruner for publication as plate B V in the second edition of Justus Perthes' 1854 Historich-Geographischer, Hand-Atlas zur Geschichte der Staaten europa's vom Anfang des Mittelalters bis auf die Neueste Zeit. Very good. Blank on verso. Minor discoloration near title area and over 'M' in 'Mare Britannicum'. Original centerfold. Original platemark visible.